On 23 April 1843 Felix Mendelssohn Bartholdy made a ceremonial presentation of a monument to Bach in the courtyard of the Thomaskirche in Leipzig, where Bach served as cantor and where his remains now lie. Mendelssohn Bartholdy worked tirelessly to make the monument a reality. He offered suggestions about its details, gave concerts to raise the necessary funds, and handled much of the project’s organization. His many letters provide information about his commitment to it. Now known as the Altes Bach-Denkmal, it may be the only example of a monument built by a composer to honor another. 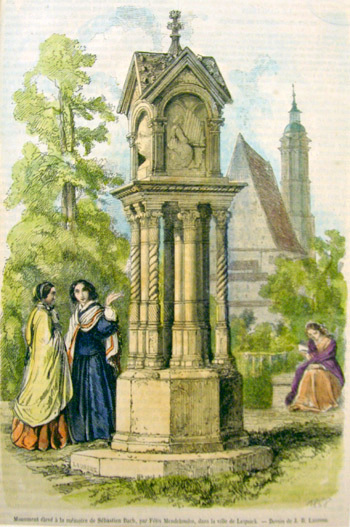 This according to Ein Denkstein für den alten Prachtkerl: Felix Mendelssohn Bartholdy und das alte Bach-Denkmal in Leipzig by Peter Wollny (Leipzig: Evangelische Verlagsanstalt, 2004). Above, a woodcut depiction from around 1850.